Set at the end of of the sixties The Kremlin Letter tells the story of the highly skilled Naval officer Charles Rone (Patrick O’Neal), who is recruited by the CIA to track down a rather embarrassing letter that’s possibly fallen into the wrong hands. The letter is, unsurprisingly perhaps, something of a macguffin and directer John Huston, who was also instrumental in penning the adaptation from the Noel Behn novel on which it is based, uses this somewhat fruitless quest as a way of spinning an elaborate and sordid spy tale that can absorb an audience, possibly confuse them and even occasionally disgust them. 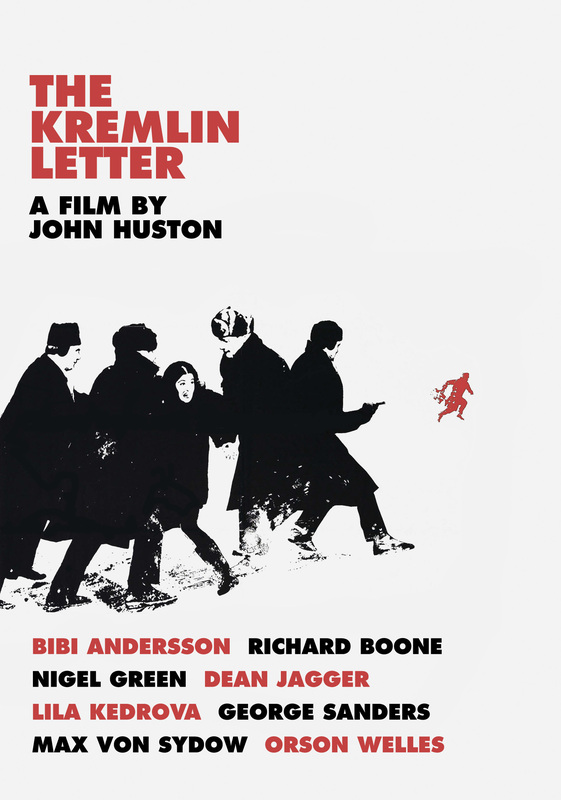 It seems almost trite to point out but The Kremlin Letter is the antithesis of the bulk of the Bond series up to the point of the film’s release, with the exception perhaps of On Her Majesty’s Secret Service released shortly before it, and in many ways The Kremlin Letter plays like the death knell for the fun knockabout spy film craze that dominated the 60s both in the US and also across Europe (with OSS 117 and Jerry Cotton, in France and Germany respectively). The Kremlin Letter does nothing to confirm the idea prevalent in those films that there are super-heroic spies out there protecting their respective countries from evil-doers. In fact it is never entirely clear in The Kremlin Letter who the villains really are, and despite Rone’s special abilities, he’s the master of many languages and martial arts and has a photographic memory, he’s also riddled with flaws and weaknesses both physical and of the more moral/ethical nature. Huston’s take on the spy film is a bleak one, stark and not much fun from the outset, but for those looking for something a little meatier than the relatively surface level pleasures on offer in so many spy films, The Kremlin Letter provides an (almost too) complex plot and a glimpse into the dark and sadistic side of espionage. The new DVD from Eureka presents the film in its original 2.35:1 aspect ratio and the new transfer is quite striking. Despite being a little soft in places it is of a very high standard, with a better picture than is seen on many of the lower end Blu-rays out there, and the new restoration has been done with definite care. The audio is clear with a wide range and the only issue really is the bizarre production choice to do voiceovers in post production to transition foreign language scenes into English. A very strange decision and one which is very distracting when watching the film. The disc is comes with no supplemental features. The Kremlin Letter is available to buy or rent on DVD from the 25th of July.